I can't believe today is February 1. I feel like Christmas was yesterday. Life goes by so fast! I decided that since in 13 days, it'll be one of my favorite holidays, Valentine's Day, I'd write a post giving some ideas for the day/night. Whether it be spending time with friends or out on a fancy date, I put together some ideas to help relieve the stress of looking good. 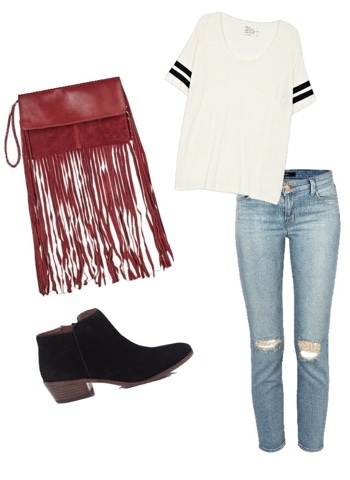 For this, I paired a cute striped sleeve tee with some ripped skinny jeans and a cute pair of ankle boots. To add some Valentines Day love, I added a red clutch to give a pop of color as well. This would be perfect for a nice dinner out, or even if you're in the mood to dress up for the sake of the holiday. I picked two jumpsuits because they're classic, chic, and fit everyone in the right places. Again, to add the Valentines Day feeling, I added a pair of pink suede or red heels. For the third look, this is for if you'd like to feel dressed up without the hassle of going full out. I put together a pair of dark maroon skinnies to be in the pink/red family, along with an off the shoulder black sweater, a simple black bag, and some basic black ankle strap heels. I hope these outfit ideas can aid you in some way this holiday, let me know what piece is your favorite from the three looks. Also, thank you to everyone who participated in the giveaway, it was so much fun working with Shop Vitamin Sea. I'll definitely be hosting more in the future.